This upcoming weekend, a friend of mine is photographing my finished quilts so I can get them listed on Etsy and a few will be pattern covers, once I write the patterns up. 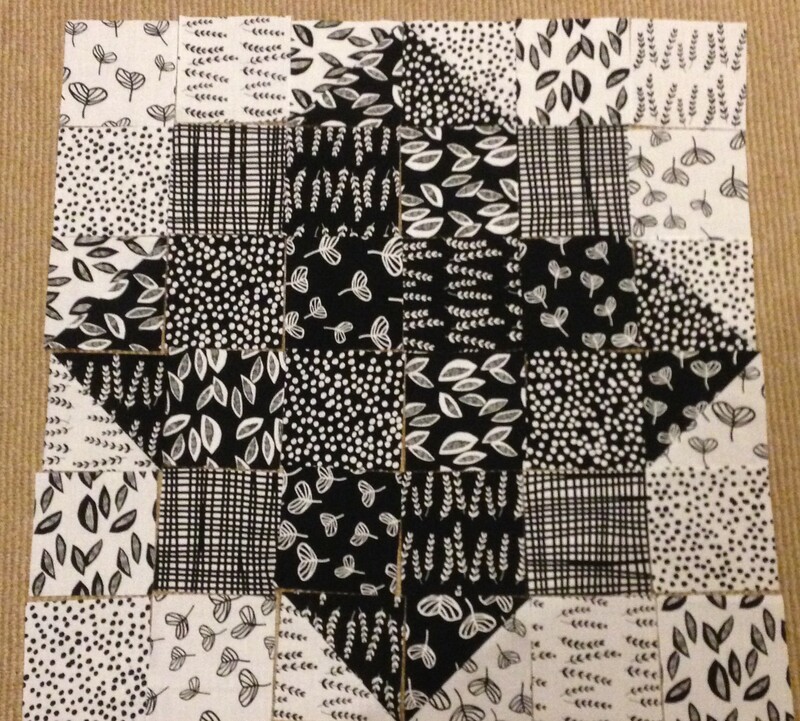 So this and last week have been filled with finishing quilts. I’ve attached the binding onto 3 quilts and have cut the strips for 2 more. This also involved going through my boxes to find a specific fabric that I wanted to use for the binding, which was in the very bottom box in the stash (of course). In the process, I found my Wizard of Oz, Candyland, and Peter Pan fabrics which I plan to sell on Etsy. It’s been a productive week… just not many exciting pictures. 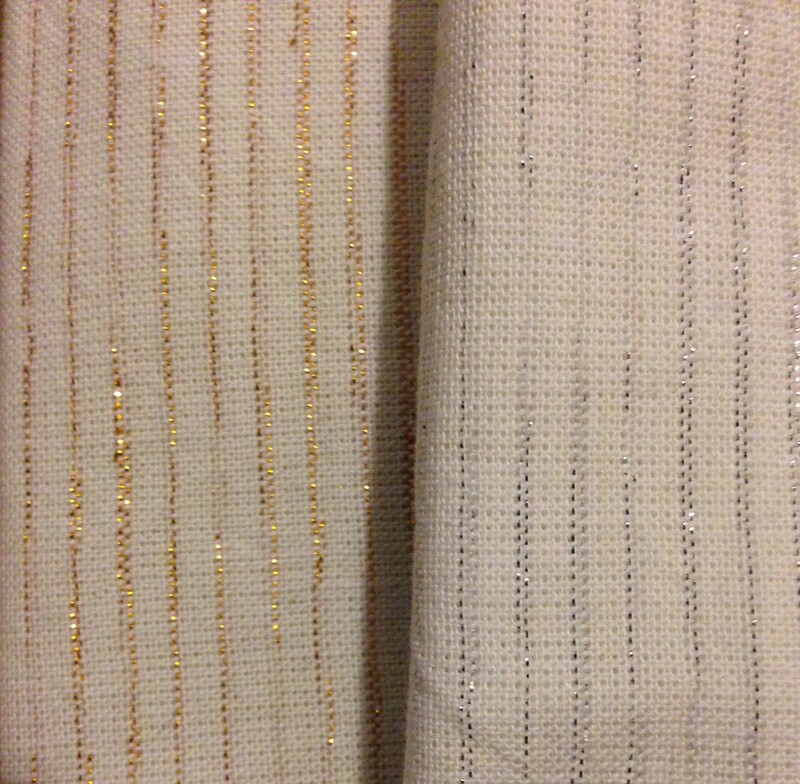 But… while trying to finish projects and realizing how many I have in the queue and saying no new projects or fabric… I of course bought fabric and committed to a new project. Obviously. The fabric was a Massdrop deal. I got 75 beautiful solid fat quarters by collection. And I got it for only $1.50/FQ which is a ganga of a deal (my credit card didn’t quite appreciate how good of a deal it was). I put the fabric up on my cabinets at work and am enjoying just looking at the fabric, so they might be hanging out at work for awhile. It’s so pretty and pet-able. SpriteStitch.com is doing a cross stitch-along for April and May. In April, we submit patterns and vote. 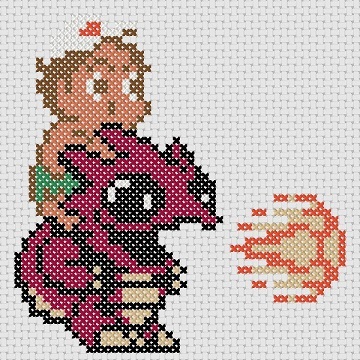 In May, each week, they post one of the winning patterns and everyone cross stitches it. There will be 4 patterns total. Here is my submission from Adventure Island 2. Cross stitching is a little tough on my hands and just not my favorite thing in general, so my plan is to participate with fabric squares. Each block is 50 pixels x 50 pixels, so I’d do 50 x 50 squares = 2500 squares. Times 4 blocks. So I’m insane. 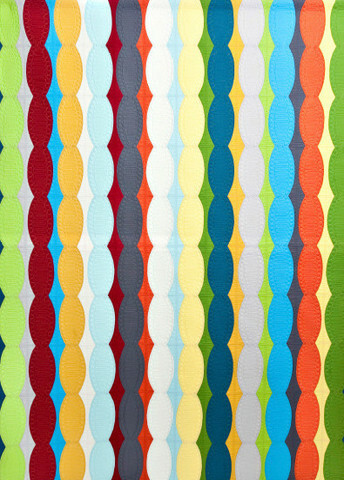 I want to try out a technique using fusible backing that I read on Cora’s Quilts. 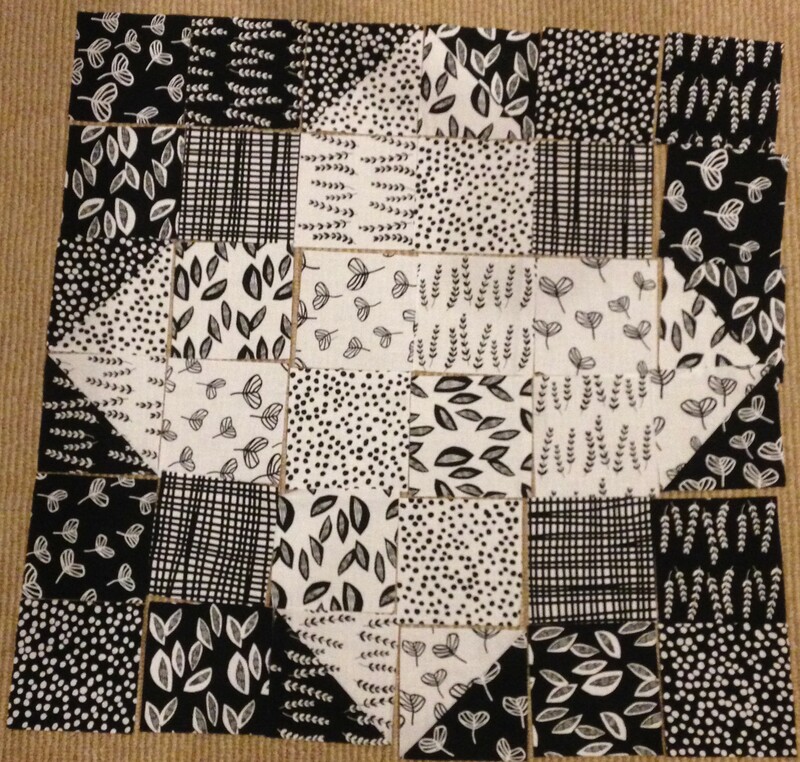 The basic idea is that you cut each individual square, glue them onto a grid, and then sew along the grid. 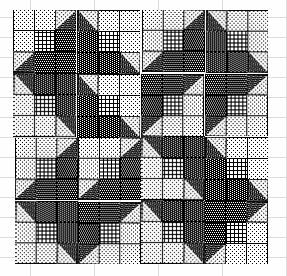 I’ve seen this done before and have been intrigued but after reading Cora’s Quilts’ wonderful How To and seeing her Nintendo quilts, I am prepared to try this. And will jump in with 10,000 squares because, why not? 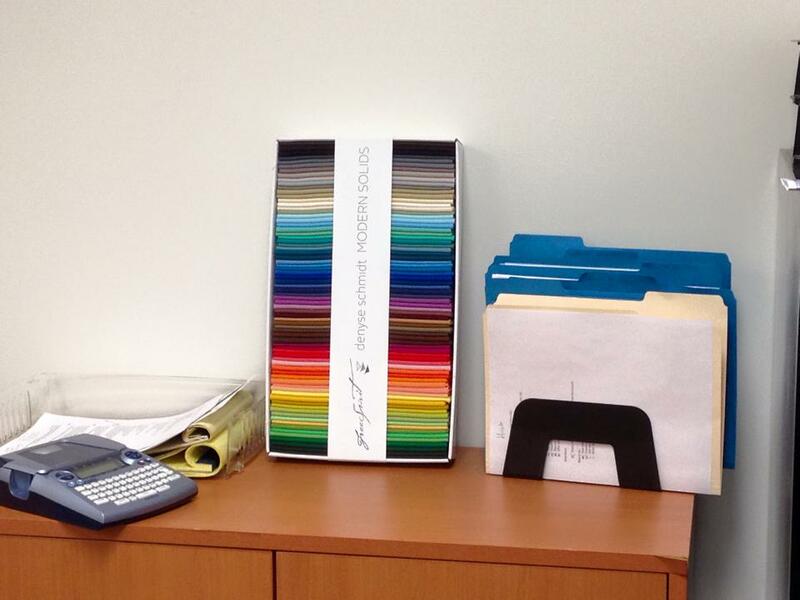 Assuming I can get myself to remove the office decor, my plan is to use the FQ solids. There will be some prep work over the next 2 weeks but the bulk of this project starts in May! About 6 months ago, I was introduced to Massdrop.com. The idea is that the site approaches vendors to buy items in bulk quantities, thus getting wholesale pricing, and is able to pass on the wholesale pricing to the customer without us needing to buy in bulk. They have various categories – audio, hobby, keyboards – but the one that I care about is quilting. I’ve purchased a few things through them and was really happy with the service and products. I’ve been trying not to spend but I do check in daily and follow the discussion boards and participate where I can. Right before I left for my trip, a gal at Massdrop contacted me and said they wanted to send me a goodie box as a thank you! My box was waiting for me when I got home from Asia and I squee’d for a few of the items. First off, was the Andover Chambray fat quarter pack that I had been on the fence about ordering (but ultimately decided against). They’re homespun fabrics where they’re made by weaving fabric threads together, rather than printing on dyeing fabric. They tend to ravel a bit more because they’re less tightly woven. What’s also cool is that there’s no front or back to the fabric. A few of them even have gold threads woven in! The next item that made me squee was two cones of thread. I was running low on my black and white threads, so this was perfect. Upon closer examination, I saw that this is Aurifil thread and about fainted. Aurifil is one of the highest quality quilt fabrics on the market, wonderful to work with, and costs quite a bit more than the cheap stuff. I use the cheaper-but-still-100%-cotton threads since money’s always a little tight so this was like Christmas. These cones would cost $40-50 retail, each. Woohoo! 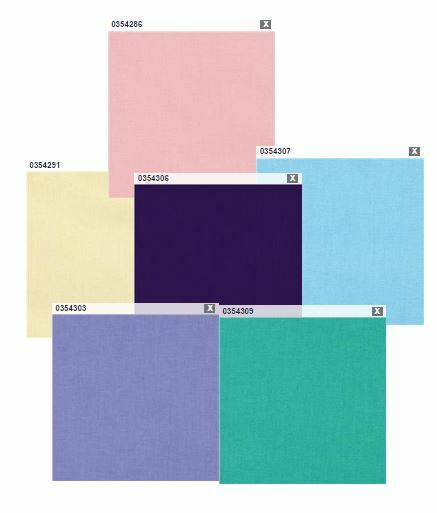 I also got a color card for the Michael Miller Cotton Couture line. 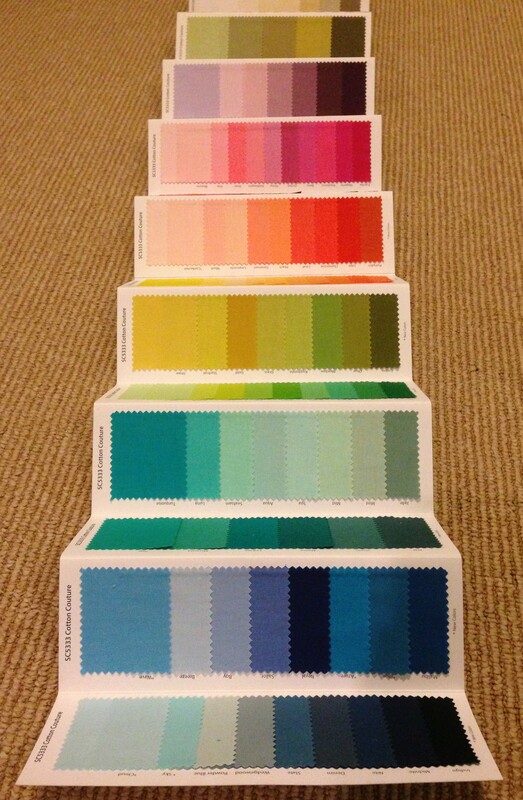 When you open up a color card, it has a little swatch of every color in the line. 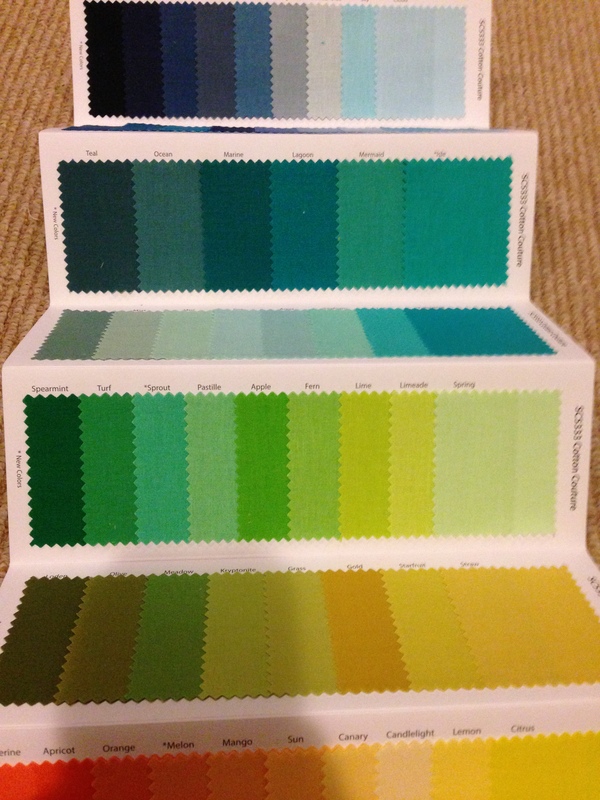 It helps give you an accurate idea of what the colors look like when shopping and is kind of yummy to look at. 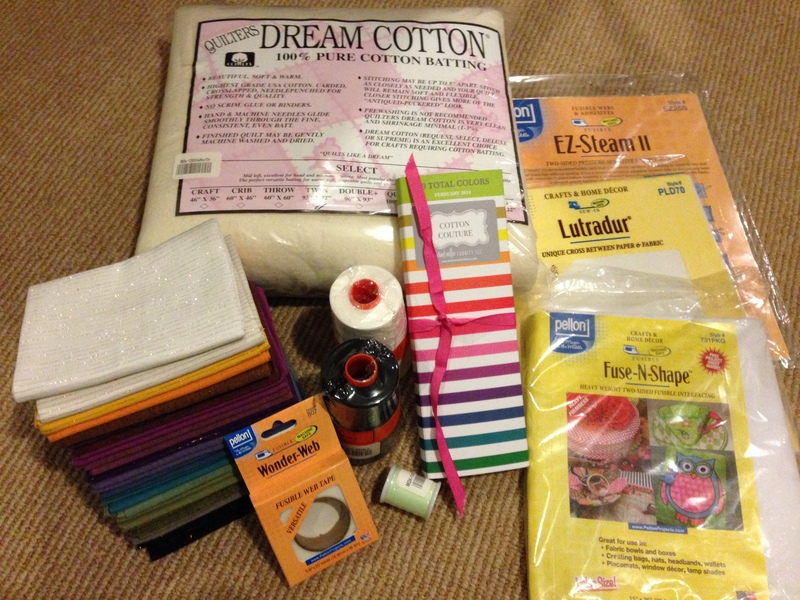 There were also a bunch of fusible products, printer fabric, glow in the dark thread, and cotton Twin batting. All of which I “need” for upcoming projects. I’m so excited to start playing with my new toys. I feel very spoiled and love. Thank you Massdrop!! 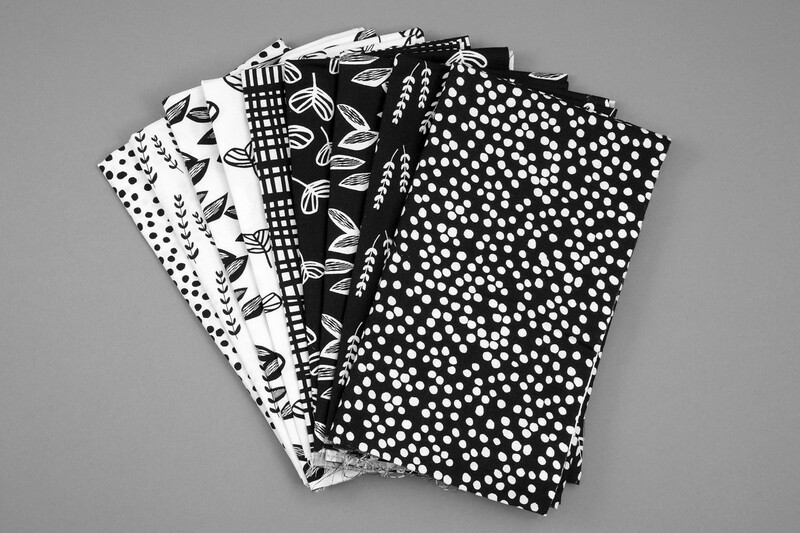 Recently, I purchased these fat quarters from the Sylvia Collection by Lotta Jansdotter. I had 4 white and 4 black and 1 that I was hoping would read as in between. I liked that each of the 4 prints had an inverse, since I’ve been playing with inverses lately. Some sketching and math later, I came up with this block. 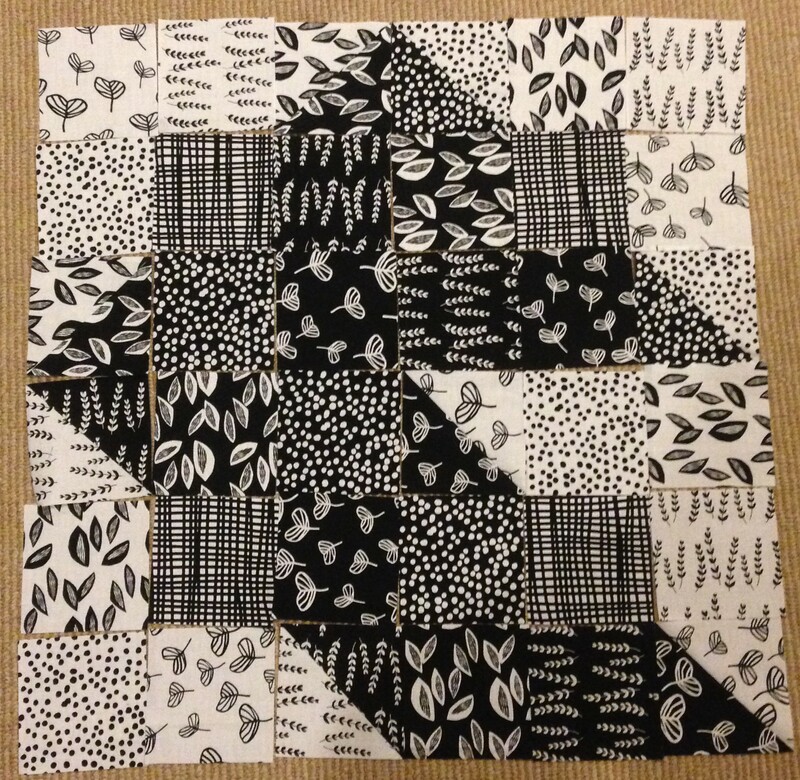 I was able to get 16 squares of each FQ which make 16 of those blocks, which is a lovely number in quilt. When I got the fabric cut and the HSTs sewn and laid out, the fabrics read busier than I was planning on and the design gets lost. 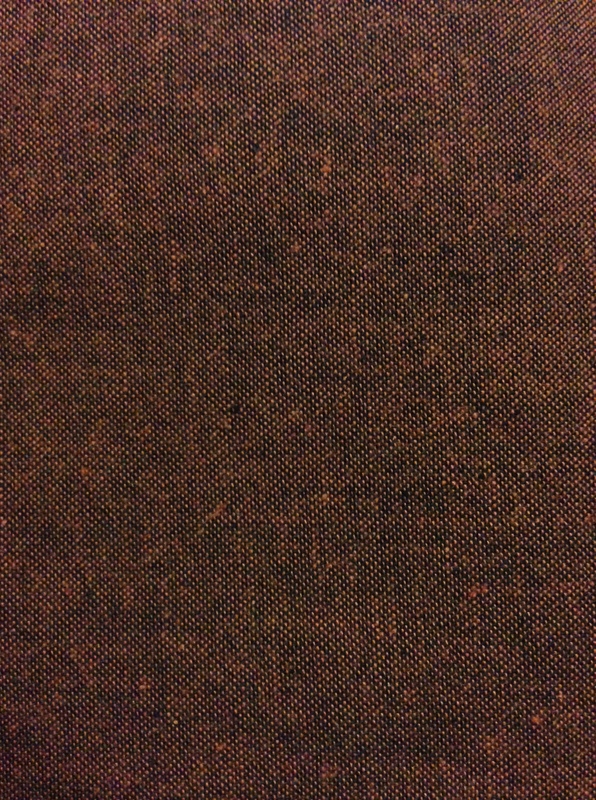 The other problem is that the fabric that I wanted to read as in the middle was reading as black. I played with a few other arrangements before deciding on the one with the black on the outside and white in the center. A few hours later, here’s the finished quilt top! The quilt top is about 48″ square. While I was in Tucson, I donated the quilt at Quilter’s Market. About one month ago, I purchased the Quick Curve Ruler from Sew Kind of Wonderful. This ruler promises to make it easier to cut concave and convex curves that fit perfectly together. I haven’t had a chance to play with it yet but I am incredibly excited and hoping it works as well as it promises! I wanted to use a single color of the background. When I initially was shopping for fabric, I was planning to do a light background (a beige was the front runner) with my usual bright, bold colors for the beads. But, I decided to change it up and challenge myself to work outside of my comfort zone. I chose a dark purple for the background and the 5 lighter colors (below) for the beads. In the original pattern, each bead strand is one color – I’m planning to mix them up. 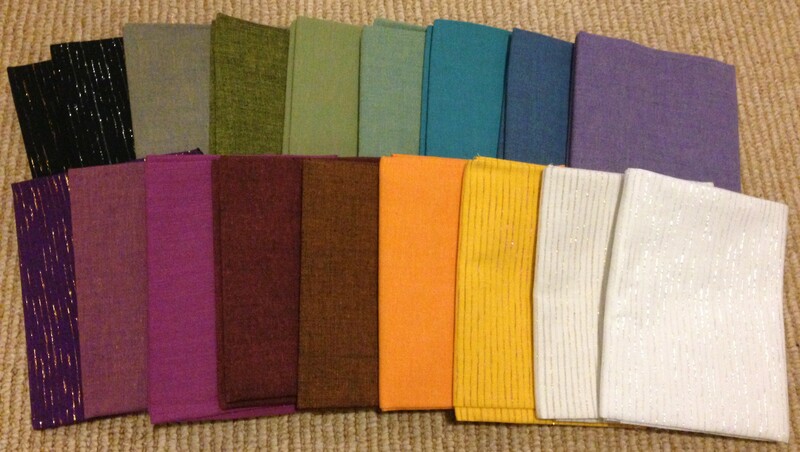 These are the American Made Brand solid fabrics which are gorgeous. Every time I walk by them in a quilt shop, I just need to pet them. They’re made near me in Seattle, so that’s a nice bonus to stay local.